A lot has been happening since I met culinary experts Professor Pushpesh Pant and Chef Nishant Choubey at the Tasting India Symposium in Delhi last December 2017. At that time, Chef Nishant was curating food experiences at the elegant aero-city Roseate House. Soon after, Chef teamed up with the Professor to go full-speed on a mission redefine what Indian cuisine means to the world! 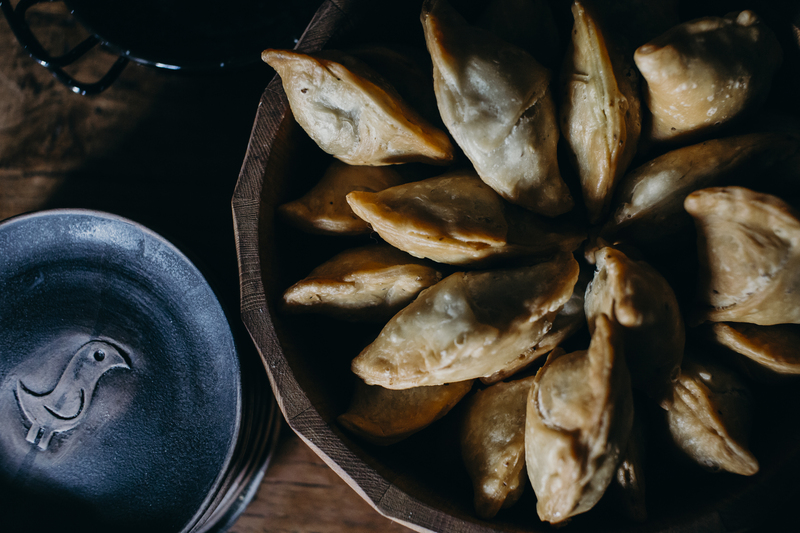 A mission inspired by Tasting India’s Indian Food Manifesto. Globally, Indian cuisine suffers from pretty much the same fate as Chinese cuisine. The extraordinary subtlety and diversity of Indian cuisine is often lost in globally standardized dishes. Chicken Tikka Masala might make good business and comforting takeaway food for a Brit like me, but too often this kind of fare just ends up confining the image of Indian cuisine to an inexpensive, greasy afterthought. 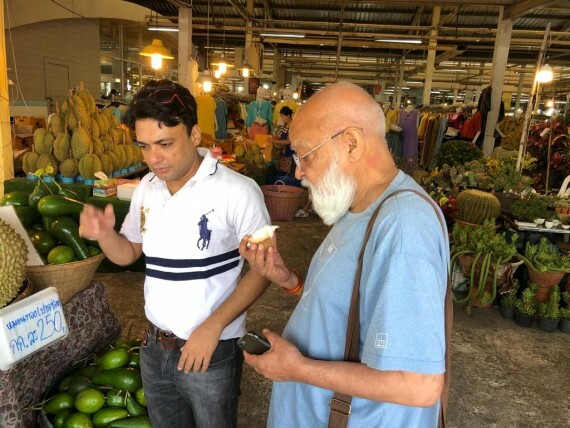 Chef Nishant and Professor Pushpesh Pant shopping for fresh produce in Delhi. The Holy Grail: nurturing a nations food heritage. 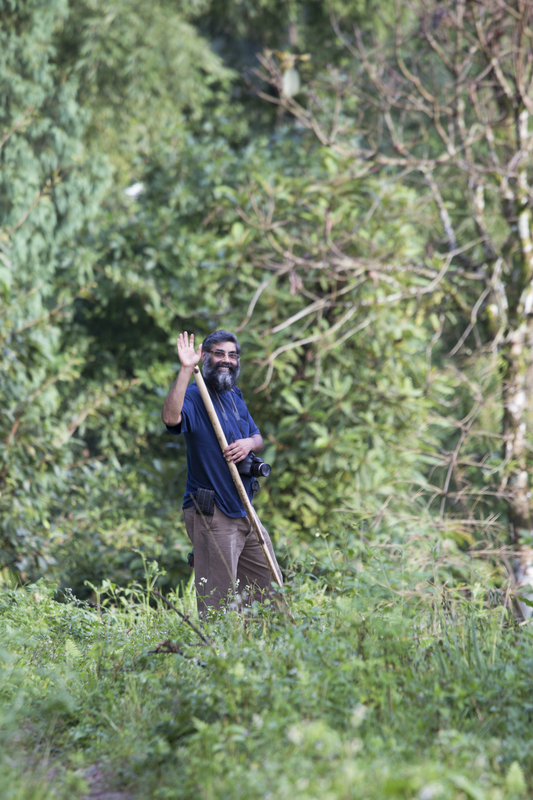 “There is an urgent need to document the dishes of the Indian continent before they disappear forever,” says the Professor. Already so much has been forgotten. Even the diversity of ingredients is slowly disappearing as people move away from an agricultural way of life and food is increasingly mass-produced for supermarkets. India’s socio-economic landscape is also taking its toll. In the past, cooks were often servants, and recipes were handed down orally, with subtle variations from household to household, let alone region to region. Food is the strongest expression of our humanity. In Europe, food is recognised as the guardian of a nation brand’s identity and a main driver of the economy. A huge emphasis has been being placed on protecting, sharing and communicating food heritage in France, Spain, and Italy, for example, so that the plethora of industries connected to food can thrive, both for export and also as attraction. Food museums are also starting to appear, to try and help to preserve global and local food heritage in archives. Restaurants and chefs, inspired by the likes of El Bulli and Noma, are researching locality to explore the meaning of food for future generations. Food heritage has become synonymous with quality as well as quality of life. The European Union has schemes to protect and distinguish traditional regional specialties, such as the protected designation of origin (PDO), Protected Geographical Indication (PGI), and Traditional Specialties Guaranteed (TSG) certifications. To consider what is happening to centuries of knowledge and rich culture of war-torn countries such as Iraq and Syria is heart-breaking. The loss is hard to fathom. 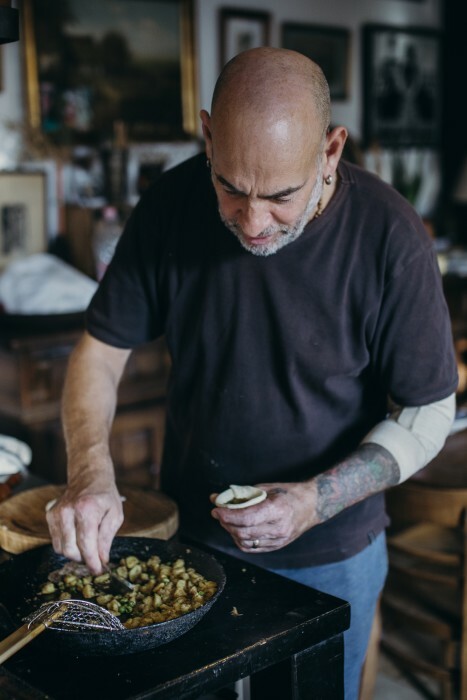 Food heritage runs so much deeper than the recipes you find in restaurants. It’s in people’s homes and hearts. 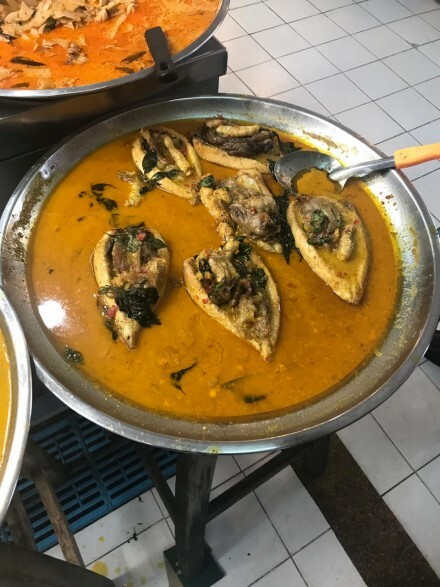 Food provides the earliest knowledge of locality, interconnectivity and sustainability, that enabled our ancestors to thrive and trade internationally. It includes site-specific knowledge about wildlife, plants and animals and the methods of food production and resources that enabled farming villages to appear. These farming communities were by nature ‘integrated ecovillages': communities that grew diverse crops and grains, tended to cattle and orchards, made their own crafts and textiles, and supplied local networks of breweries, artisans, markets, hotels and inns. Food heritage is a dynamic spectrum that gently evolves and changes form over changing geographies and landscapes. But it is a story that is continuous and connects us all and refuses to be contained within national boundaries. 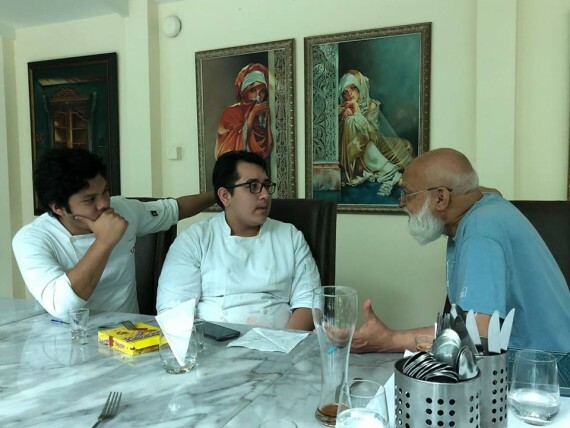 Currently, the Chef and the Professor are curating food experiences for an upcoming festival in Delhi hosted by the Asian Heritage Foundation in association with World Bank. 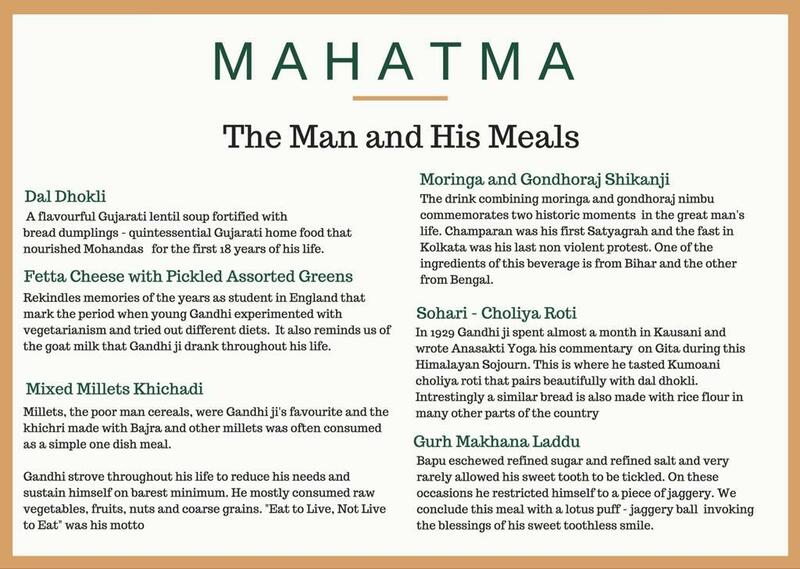 One of the meals curates a selection of dishes that were loved by the great Mahatma Gandhi, to commemorate his 150th Birthday. The meals that the great Mahatma Gandhi loved. 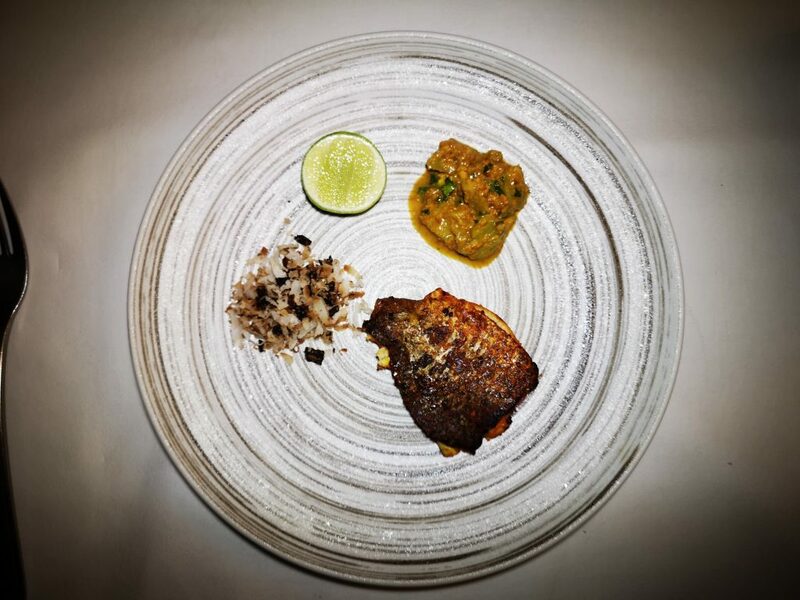 One of the first pop-up events the Professor and Chef did this year was at the famous Indus restaurant in Bangkok. Indus has been in service since 2006 and making waves with fashionable international crowd since winning its place in the Michelin guide. Indus is one of the few restaurants to introduce quality Indian cusine to the west via fine dining. Inviting the Professor and Chef to curate a menu outside the known Moghul dishes was a statement in itself. 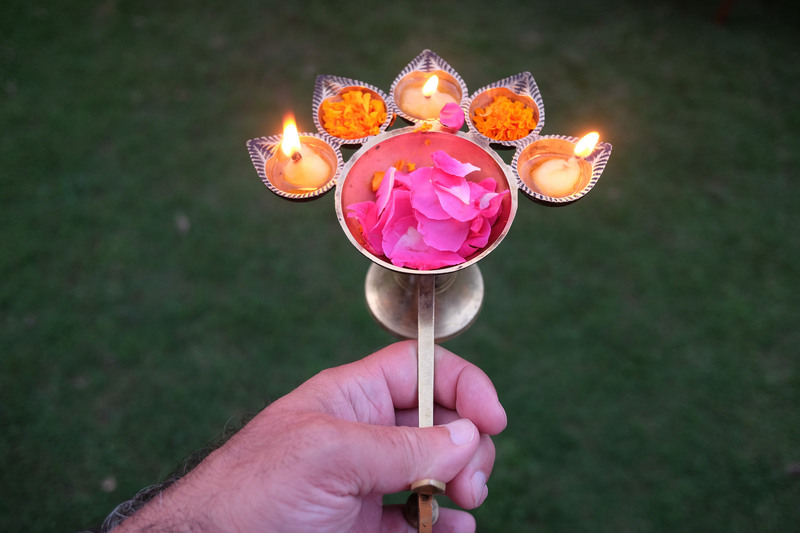 A provocation, perhaps, and a gateway invitation to Michelin to go and experience India? At Indus: Kadala Byas Minu, or Kombdicha motla, representing Mangalore. The fish is marinated with kokum, a plant in the mangosteen family. 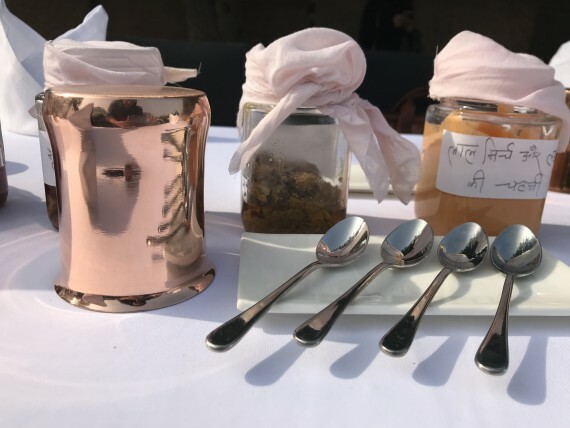 Chef and Professor curated a meal for Indus which they called: Past, Present and Future; 10 courses inspired by 10 regions. Each course told a special story about the history of the region it represented, and a special ingredient that is at risk of being forgotten. In contrast to the impeccable meal at Mrs. Radha Bhatia’s Roseate Farm last December this meal was not pure vegetarian – but contained seafood, meat and poultry. 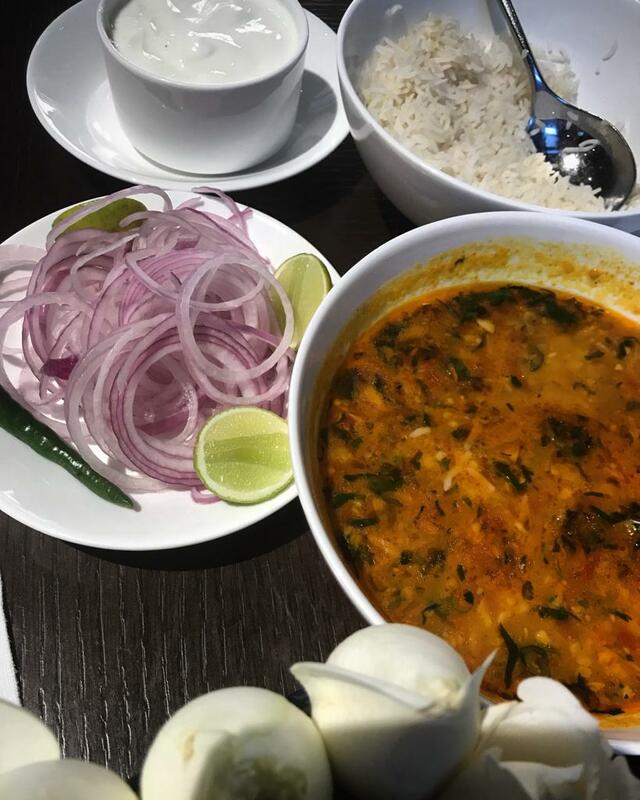 The Chef and Professor continue to travel India researching traditional recipes and ‘lost gems’. 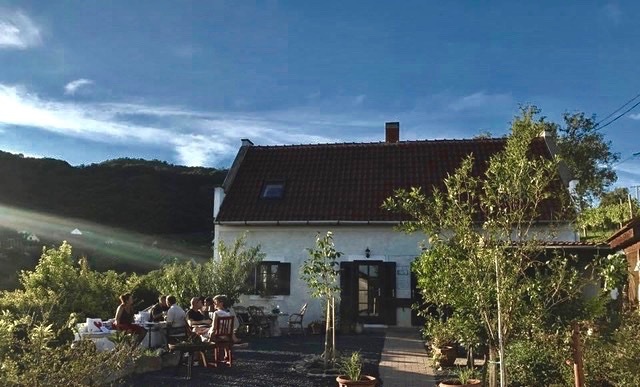 They travel to a region, follow locally known food trails looking for local superfoods, they forage in forests and meet food producers and talk to local people about food celebrated in folklore. Most recently, they have focussed on the hill state of Uttarakhand, Himachal Pradesh, as well as Jharkhand, Chhattisgarh and Orissa. Professor Pushpesh Pant talking to young chefs at Indus, Bangkok. “We work together like conjoined Siamese Twins!” says the Professor. They have two more members in their core team; Zuber Baigh helps them with archival documentation and media, and Govind Singh Kirola is in charge of the ethno-botanical and cultural anthropological research. The Professor and Chef travel together following the leads of the researchers who support their fieldwork with ongoing research. 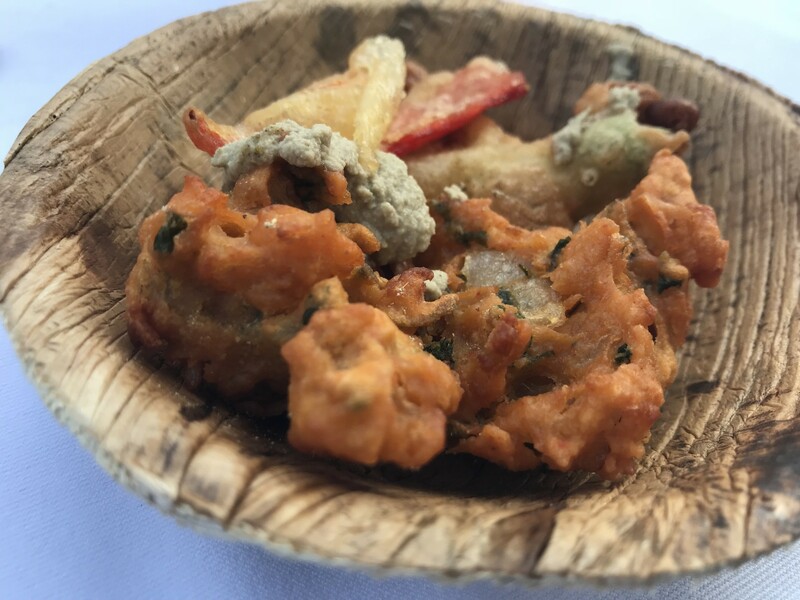 “Our dream project is to set up a culinary institute specializing in Indian vegetarian cuisines,” says Chef Nishant. The Professor concludes. “And for India we wish three things; That there should plenty for everyone to eat, with freedom of choice to eat what one wishes to eat. This is a matter of distribution. We have plenty. Secondly, food should be healthy and free from all artificial flavors, colorings, preservatives, and synthetic additives of any kind. The Vrikshalaya Center, Uttrakand, www.foundnature.org. 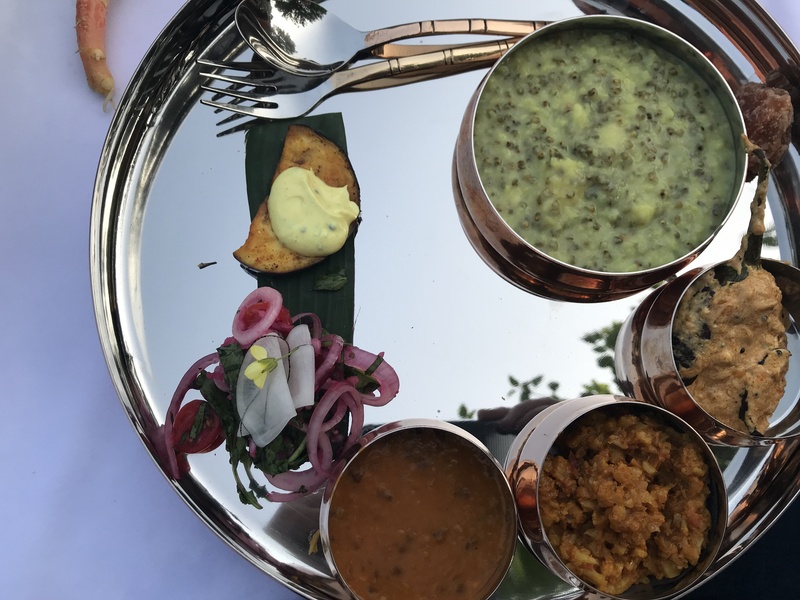 How I first met Chef at the Roseate Hotel, Aerocity: I have never had such a delicious Tarka Daal, and to this day I do not understand what Chef did to elevate such a simple and well-known vegetarian dish! We soon got talking, about food of course. The inauguration lunch of the Tasting India Symposium in Delhi, last December 2017, was at Roseate Farm; a venture into small-scale organic farming and the ‘heart project’ of Mrs. Radha Bhatia, Chairperson of the Bird Group that owns the family of Roseate hotels. 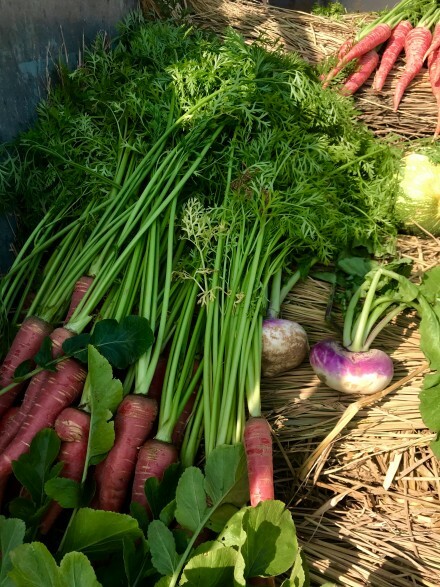 The farm supplies the Roseate hotels in Delhi with organic produce. 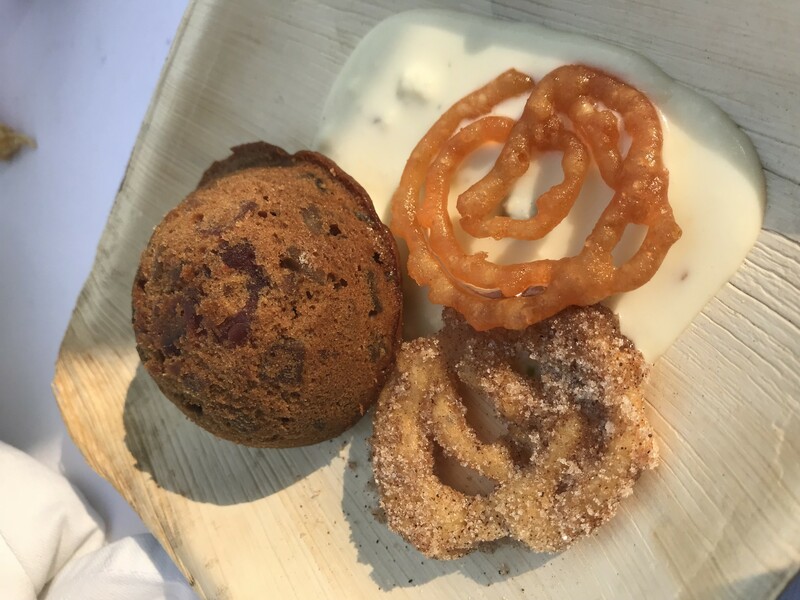 Tasting India is a platform and symposium founded by the Cultural Curator, Sanjoo Malhotra and Food Writer, Sourish Bhattacharyya. Sanjoo and Sourish are on a roll, to say the least. Tasting India has the highest ambitions to create a sustainable food culture in India. It is actively connecting all types of stakeholders working within organic food production; from small-scale farming that builds local community resilience, to food distribution such as independent food brands, farmers markets, coops for local crafts and traditions, to experience promoting regional and cultural diversity, such as education, chefs working with seasonality, eco-tourism and environmental sustainability, and last but not least- NGOs working with human ecology, from gender and identity to food sharing. 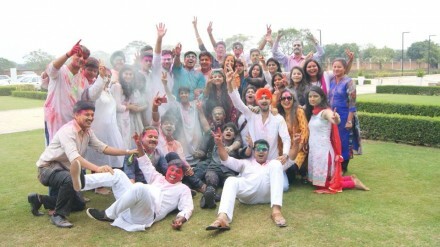 A happy day for Roseate Hotel’s Chef Nishant Choubey. 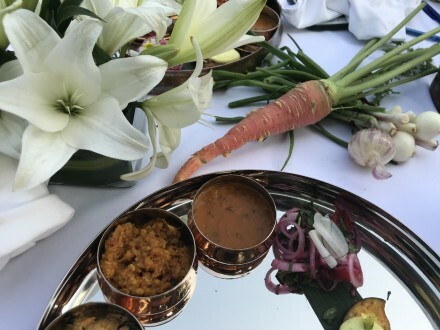 The symposium’s launch meal was a tasting menu and journey into Ayurvedic thought, designed by Chef Nishant Choubey, as representative of the produce from the idyllic farm settings. Everyone can still eat like this if they keep two things in mind, the professor says. The word Ayurveda is Sanskrit, meaning ‘life-knowledge’. It’s a complete system of how to maintain health and balance in life, the philosophy of health at the heart of Jainism, Buddhism and Hinduism, and permeates every aspect of life, not least of all, food. Simple yet delicious Gobhi Keema Adraki, Cauliflower and minced ginger. Food is at the centre of life. It is pleasure and it is nutrition. It is culture and identity. In the Ayurveda tradition, food functions to build a healthy metabolism, by moderating foods that can be harmful to the mind or body. When you consider the Ayurveda way of food, you will see an overlap with cultures from all over the world. Food is life, food is medicine. A nutritious and balanced diet can limit diseases stemming from internal inflammation. The Ayurveda approach to food is known as a ‘Sattvic’ diet or ‘yogic’ diet. It is supposed to be a conscious, holistic approach, from producing to consuming, that today we call ‘from farm to table.’ But from farm to table is nothing new- this is the way everyone used to eat and the way some rural communities still support themselves. The diet itself has an innate awareness of the connectedness to nature and interconnectivity with community upon which we all rely. It places emphasis on nurturing the essential: using seasonal and local foods from your own kitchen garden or village farm. It’s about ethics and knowledge of where the food comes from and where the waste goes. A Sattvic diet is, therefore, vegetarian, as there is no need to slaughter animals to maintain our health. Cows are an intrinsic part of the organic farm though; the bullocks are used for ploughing, the cows give milk, and both produce natural fertilizer from vegetable scraps. 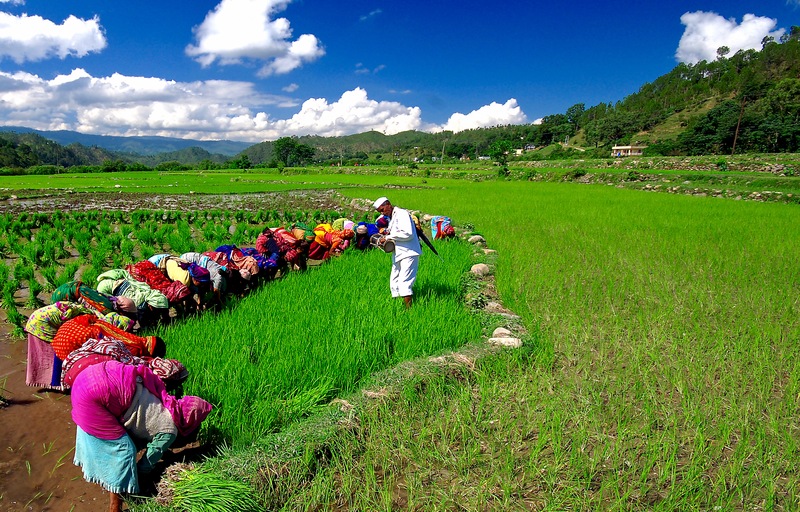 It’s the small-scale organic farming system that fed the whole of India until the 1960’s. It’s a system that could work today, if we value and support the work of our farmers, and create efficient systems and infrastructures that get their produce to market. The pickles were amazing! To call them mere pickles feels like an injustice. Most of us who have heard about Ayurveda have heard about the three doshas, or three elements called Vata, Pitta and Kapha. When the doshas are in balance, a person can reach optimal health, while imbalance of the doshas provokes disease. Or as the saying goes: ‘You are what you eat.’ What was new to me were the 6 Rasas, or 6 tastes of Ayurveda, that balance the three elements in our bodies. These are Sweet, Sour, Salty, Pungent, Bitter, and Astringent. A dish with humble origins; Khichra, a beautifully delicate and ‘more-ish’ porridge of lentils, rice and quinoa. 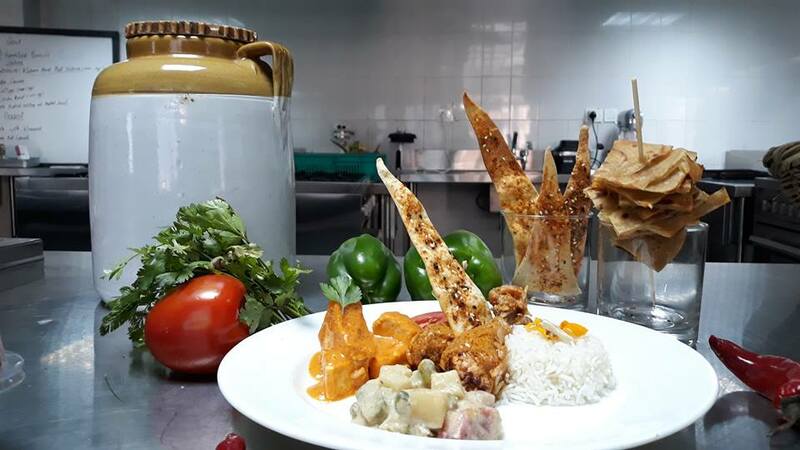 A chef working with Indian cuisine not only needs to know about the flavours of food, that make food pleasurable, but also the medicinal values of those foods and their effect on the body in combination. It’s a fundamental difference between traditional and modern eating habits all over the world. In the past, the person who prepares food is the guardian of our health. Mothers, daughters, sisters, wives. Christmas Pudding and Jelabis for dessert! 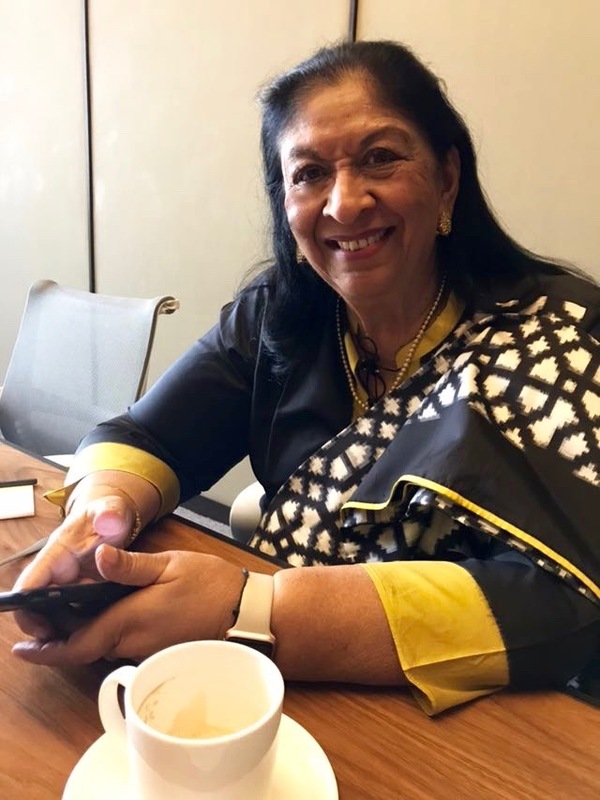 Mrs. Radha Bhatia, owner and founder of the Roseate Farm and Chairperson of The Bird Group. Q: It’s been 3 years since you gave a talk at Service Design Conference in Stockholm. It was wonderful to see the whole conference meditating with you. It palpably changed the energy in the room. I especially appreciated your advice for design professionals to ‘Just Say No!’ more often. I think that advice is more important than ever. Can you expand on that a bit? A: As I said in one of my posts about the approaching retreat, I think human beings are machines for producing works of art, and that the best works of art are nameless and invisible. Saying “no” to what is visible and which already has a name is one way into that space. I also re-read Castaneda’s Journey To Ixtlan recently and was touched by how deeply I still resonated with it. There’s a lot of ‘no’ saying in it, from ‘erasing personal history’ to ‘losing self-importance’, to ‘becoming inaccessible’ and ‘disrupting the routines of life’. The genuinely ‘new’ comes out of nowhere – and I mean absolutely nowhere, a brutally total nowhere- but we are too eager to be ‘somewhere’, no matter how shabby and derivative that ‘somewhere’ might be. I hope at least one designer out there reads this and decides to say ‘no’ to the whole works — until reappearing twelve years later with something with no name and no identity that the whole world needs. Q: What impact does your Buddhist practice have on your daily life today? How does Buddhism work as a practical guideline for daily decision making? How can this shape a layman’s decision-making to live an ethical life as an ‘ordinary’ person? A: My daily life is perfumed by Buddhism. It allows me to see everything I do as a kind of prayer. For example, right now I’m watching the world cup. It’s football and I love it, it needs no justification. My unconscious is working tremendously hard preparing for the retreat, so Shenyen is balancing that by just relaxing. I don’t need to justify it. Justifications are for people who are organising pogroms, or asset-stripping entire national infrastructures, etc. not for people who are … content just being nobody, nowhere, just talking with The Invisibles, just owning one pair of shoes … or just watching Argentina’s slalom into the knockout stage while reading Jorge Valdano reflecting on the military dictatorship of the 1970’s, along with his plea to stop treating football as a science; it all turns it all into a kind of dream yoga. And dream yoga is part of the path to Buddhahood. You cannot live an ethical life without nurturing your imagination. Elaine Scarry’s talk, Beauty as a call to justice, will explain that in detail. I re-posted it on my youtube channel. Ultimately no-one can tell you how to live, they can only seduce you into living in a specific way. Ethics thus emerges from Eros, from loving relationships — with yourself, people around you, your own karmic history, and the culture around you and the times you have been born into. 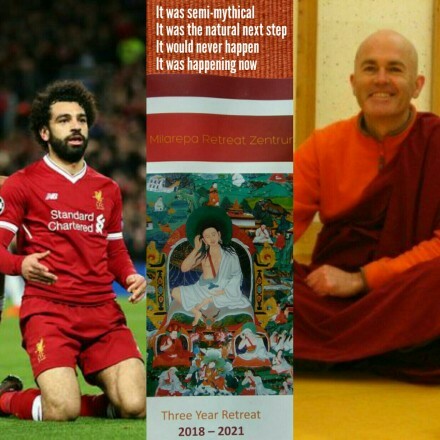 Q: You spoke once about the importance of combining Buddhist practice with your own ‘culture’ or your natural place in contemporary society as a western monk. Will you still have space for that kind of ‘personal cultural research/ observation’ on your 3-year retreat? Can you watch football when you are there?! 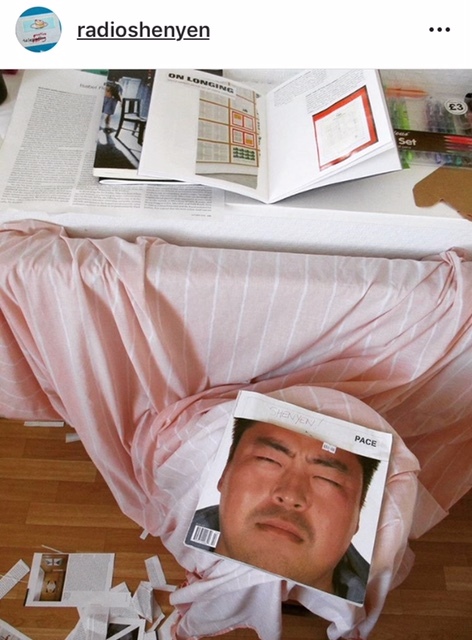 Can you read Artforum? Can you write your blog, radioshenyen? A: Football? Probably not! But in between the meditation blocks, that will usually last about 6-8 weeks per topic, we are encouraged to relax, maybe even listen to a little music. And I will have my Artforum scrapbooks with me. Enough for one exhibition a week I think! But I don’t see too much separation between the centuries-old tantric stuff and my personal interests. Doing the retreat in all its traditional structure is also a part of my ‘personal cultural research’. Q: How much meditation do you recommend to a layperson or beginner? Is frequency important for practice? Are there other types of activities such as physical work (making things, cleaning, gardening, etc.) that are also seen as part of Buddhist practice? In Asia, meditation isn’t seen as something that ‘ordinary people’ do. Lay people often ask the monks to meditate and pray on their behalf. A: Meditation is extremely over-emphasised in contemporary Western presentations of Buddhism. Ethics, study, art, service, offering, confession, purification, prayer, chanting, and vows, among other things, are all sidelined, or dismissed as ‘obvious’, ‘old-fashioned’, ‘embarrassing’ or ‘peripheral’. But Buddhism only really comes alive when you take on board it’s entire culture, it’s ‘world’ while being willing to do the work of engaging that world with your own. Thus, my love of contemporary art is inseparable from my study of Madhyamaka and tantric meditations. My best moments of mindfulness occur when on alms round. You can’t just meditate in a vacuum, in a fog of mundane activity and thinking. But nevertheless, it is part of the path. I would recommend a very short commitment — 10 minutes a day is fine — to being quiet, still, disciplined and visionary on one’s cushion. But instead of wanting to meditate I would suggest that people simply pray to be able to meditate, and then relax. Thinking about what other people need — the immediate needs of the people around you right now, at home or on the train platform — is so much more powerful than some half-hearted meditation practice. Genuine meditation comes out of uncontrived faith. Faith arises out of joy and ethics. Ethics from art and empathetic disciplined imagination. Q: We need to manage negative attachments to the idea of future, such as fear or sadness or anxiety, as these feelings arise, to avoid shutting down altogether. Is hope also an attachment? A: Attachment is one of those words that are easy to misconstrue. In Buddhism, liking something isn’t an expression of attachment; wanting something good to continue, or to happen if it hasn’t yet happened, isn’t attachment. Attachment is defined as a state where ‘you are willing to do something bad in order for something to continue (or begin)’. So ‘hope’ in itself isn’t attachment. Love isn’t attachment, not even fierce love. Whereas cowardice would be. Q: What is your favourite festival or holiday? What practices in your life have changed significantly since becoming ordained? A: I like New Year’s celebrations. Awareness of time cycles is a lovely thing and transcends specific religions and worldviews. And the atom bomb memorial day in Hiroshima is also high on my list of ‘things which make the heart beat faster’ – if that’s what you mean by ‘festival’. Ordination, by providing an absolutely fundamental challenge to my sense of identity, in both challenging (demanding, humbling) and transformative (blessed) ways, has helped me to explore more deeply the teachings on non-self as a meditative state. Q: How important is it to be altruistic? A: It is impossible to become a Buddha without practising altruism. And never mind Buddhahood, it is impossible to keep enjoying positive samsaric rebirths without practising altruism. All art comes from altruism. Food cooked and plated by first year students. 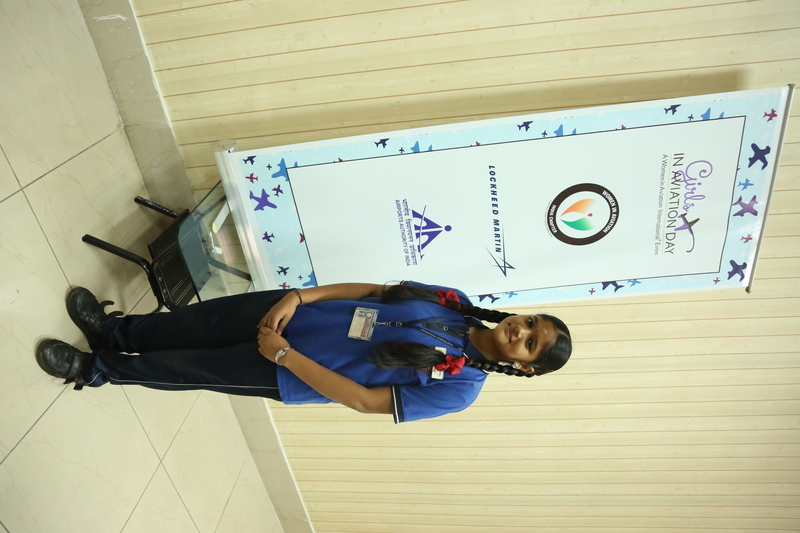 The Institute, called Vedatya, is still young but has already achieved so much. 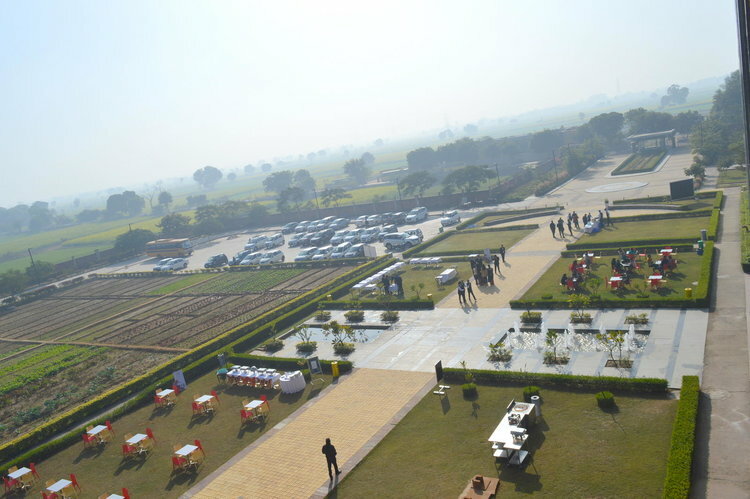 I arrived there on a sunny December day with Sanjoo Malhotra, co-founder of the platform and network Tasting India. 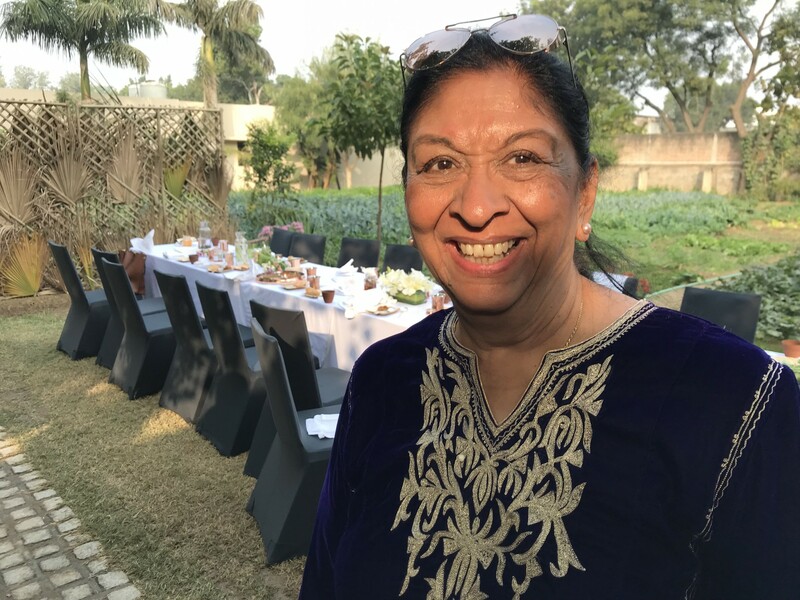 It was towards the end of Tasting India’s 2017 symposium on food, where Sanjoo and his co-founder Sourish Bhattacharya, had collected some of India’s leading influencers and change-makers. The missing piece at the symposium, until that day, had been education; how to create a new integrated learning model for organic food businesses that would teach theory in a practical and experiential way. 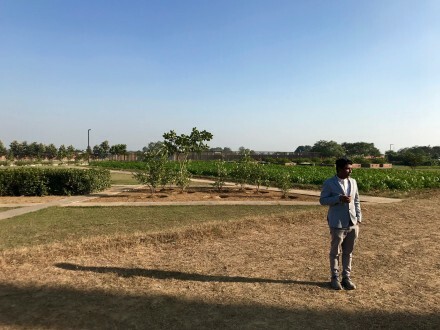 Sanjoo Malhotra, co-founder of Tasting India on the grounds of Vedatya, December 2017. From star chefs to culinary entrepreneurs. High tech buildings of the Vedatya Institute. Vedatya currently has 4 acres of farmland, a herb garden, lots of fruit trees; mango, lychee, lemons, oranges, chiku, and papaya. 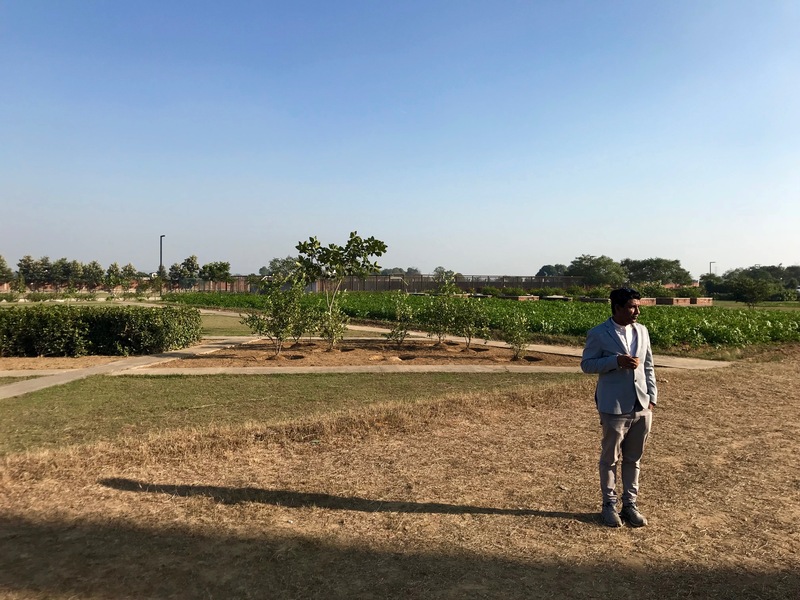 And to complete the full ecosystem of sustainable practices, the institute is going to keep cows on-campus, for both compost and dairy and develop an 100 percent organic fish farm that can also create natural fertilizer. This integrated approach to applied learning allows current students in training, as well as industry professionals, to really value local, organic produce, and explore more sustainable culinary practices. Vedatya chefs in the farm. Amit Kapur, Managing Promoter of Vedatya. 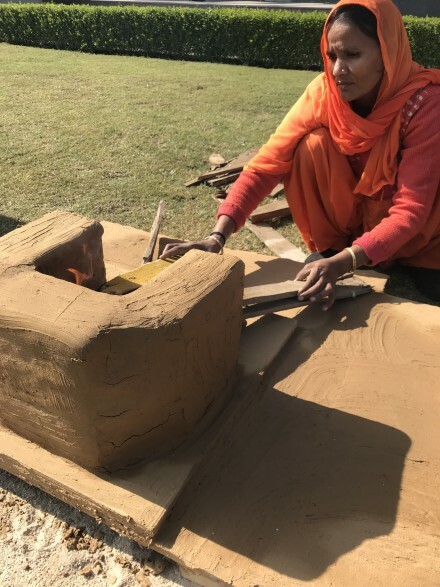 Kapur continues: “We really wanted to create something that will last beyond our lifetimes.” Ved means knowledge in Sanskrit, and Aditya means Sun. Vedatya, therefore, is a coined name that sounds like ‘Source of Knowledge.’ Its goal is to become a model for higher education and a hub of interdisciplinary knowledge with industry – where scientists and philosophers can work alongside farmers, gardeners, artists, chefs – and even engineers. 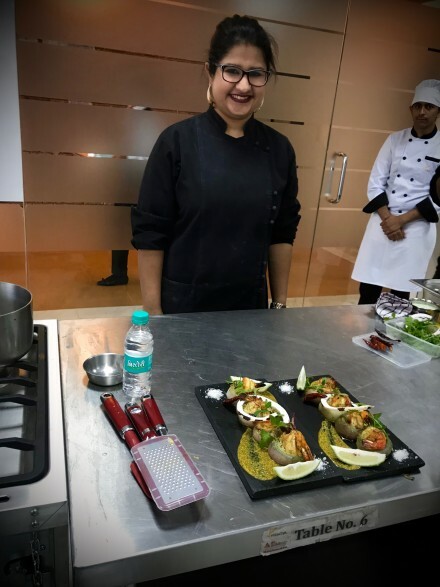 Chef Megha Kohli, Head Chef at the restaurant Lavaash Delhi, holding a class on how cuisines are reborn. At Vedatya, a chef isn’t just a chef anymore. A culinary student could work anywhere in India’s food business – from being a hotelier or restaurateur, to re-branding and distributing local products to support small scale farmers and communities. Students need to know about locality, seasonality, and heritage – as well as all the soft skills of service design. 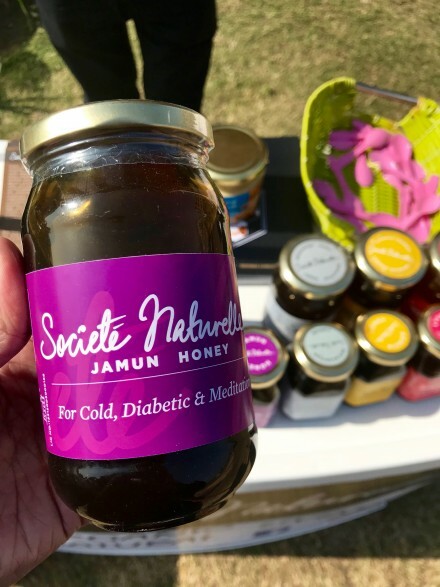 One of the Vedatya’s alumni, Preet Singh, went back home and became an organic honey producer, selling his brand across India and overseas in Singapore. 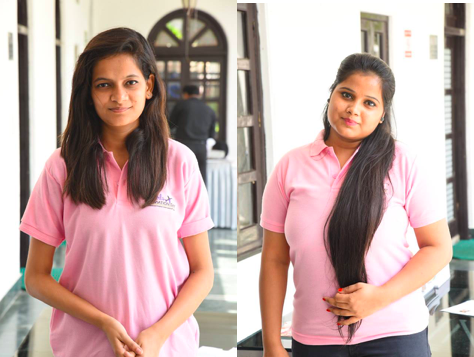 Alumni’s organic honey brand is sold across India and overseas. Another way that Vedatya is promoting applied education is by partnering with different industry players through an industry-academic partnership model that is quite unique in India. Industry partners are potential employers of Vedatya’s graduates, and so they can be an integral part of student’s curriculum that is reviewed every two years. 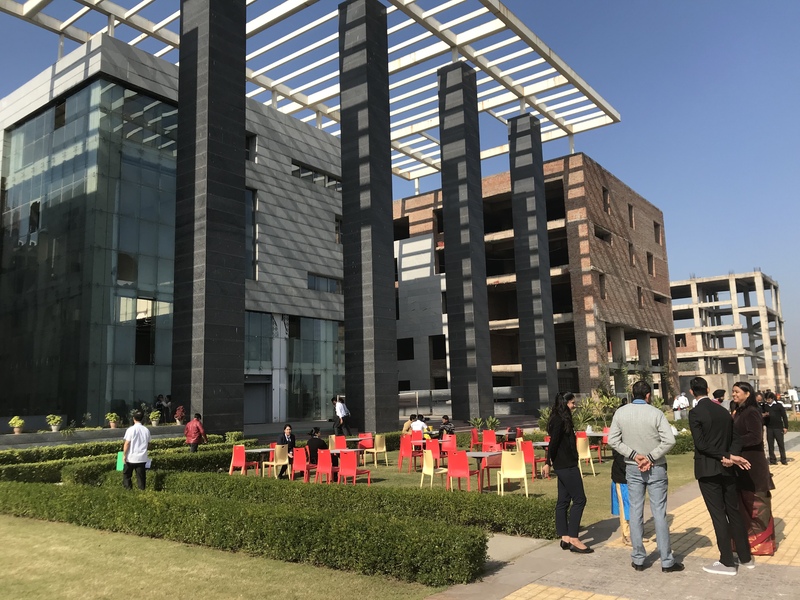 This initiative has led to partnerships with InterContinental Hotels Group (IHG), one of the world’s largest hotel companies, and with Columbia Asia Hospitals, one of Asia’s leading hospital chains, in the healthcare industry, to name but two. 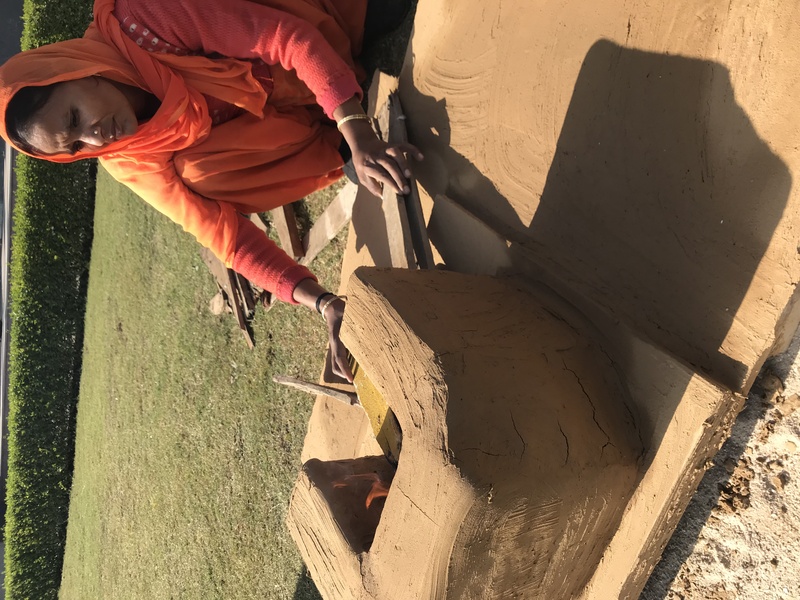 Most of India cooks over traditional wood fire ovens. Class inequity – a major challenge. Vedatya has great plans for maximizing its land with organic farming. India has huge inequalities and a very complex caste system. The villagers come from backgrounds where they have absolutely no exposure at all to rapidly changing urban life. It’s a huge sacrifice for a youngster get an education when they are expected to help their families survive. 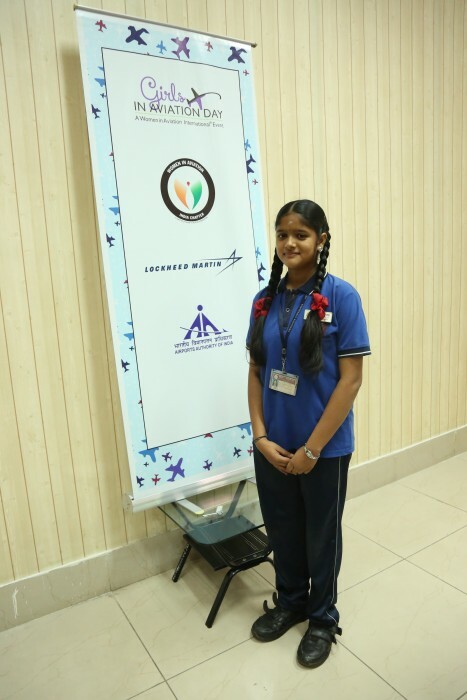 “One of our scholarship students wanted to quit after only a few months,” Kapur explained. Eventually he told the director that the reason he wanted to quit was because he is being bullied by his friends about the formal way he is required to be dressed at Vedatya. Even his family teased him for looking like a ‘plucked chicken’ because he was following Vedatya’s dress code to be well-groomed and wear a uniform. “It sounds funny to us, but he was deeply ashamed. There is a conflict and context that even we don’t understand. We are talking a difference of 20 kilometers. We need to support rural communities and give them a longer perspective. We also need to help these communities survive,” concludes Kapur. Fresh organic produce grown on site. 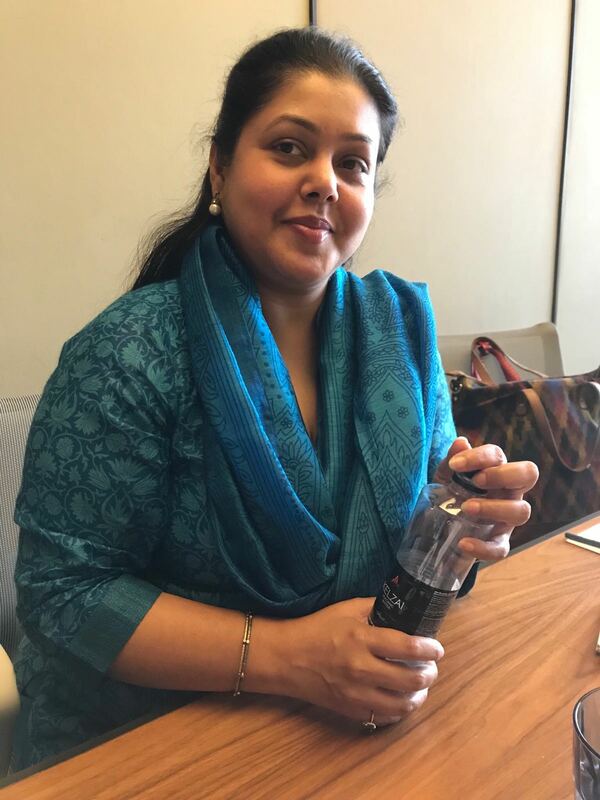 When Vedatya and the Tasting India platform talk about food, they mean everything from the production of food, to food on the plate. Vedatya believes that organic food is second nature for India and it has the potential to be the new economic driver for a sustainable future, to getting people into the workplace and tapping into new industries such health tourism. Organic farming has the ability to feed India through new distribution channels, and offer solutions to major challenges, such as how to deal with food surplus, nurture cultural diversity within the vast continent, and create major export crops and produce that can take more than India’s current 1 percent of the growing global organic market. Text by Tanya Kim Grassley. 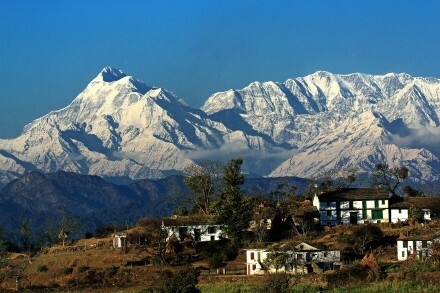 You don’t have to go to the Himalayas to find yourself – but it might help! Immersing yourself in natural surroundings brings a huge amount of physical and psychological benefits. But naturalness is much more than a superficial sense of wellbeing. It can bring us to another level of autonomy, where we are freed from all the usual external influences that shape our beliefs and behaviour. It’s about gaining insight into The Human Condition. View from Majkhali Village. Photo by Dhirendra Bisht. 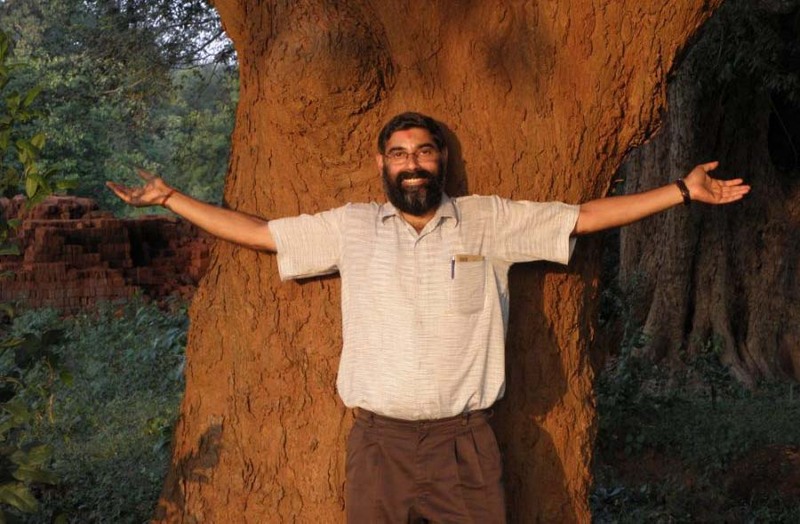 That kind personal transformation is much easier to attain with hands-on experience, says Ajay Rastogi, Philosopher and Applied Ethics practitioner, and founder of The Foundation for the Contemplation of Nature. 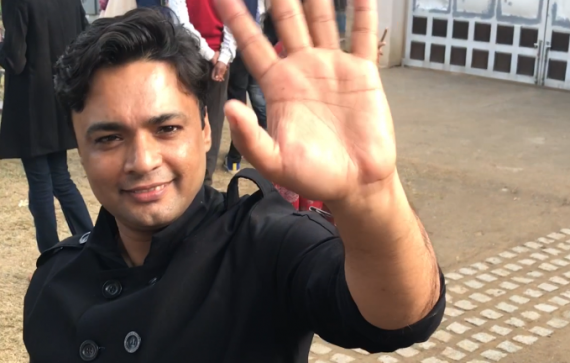 I had the good fortune to meet Ajay at the recent Tasting India Symposium in New Delhi, an event that brought together some of India’s brightest minds within food and sustainability. Like many of his contemporaries there, Ajay had left a successful career to go back to his home region and drive change from within. 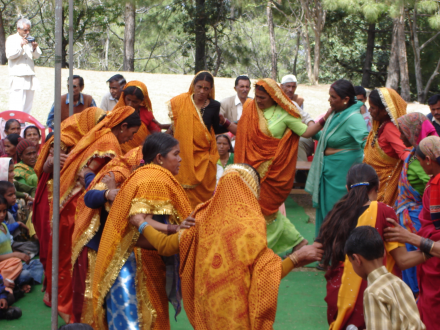 For Ajay that meant working together with the rural villagers of his homeland at the foothills of the Himalayas, in Uttarakhand. Ajay welcomes everyone, regardless of race, caste, age, religion, gender, orientation, or education. 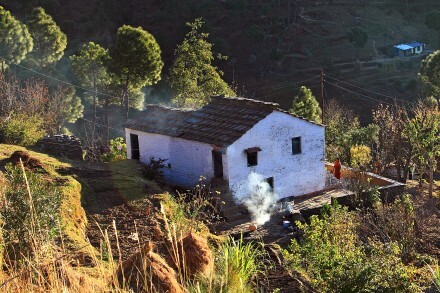 The foundation aims to research and develop new models for Resilience through cultural exchange, by connecting villagers with people from the cities and other countries in residential homestays and programs such as yoga and meditation retreats. The Contemplation of Nature is threefold; immersion in nature, mindful meditation, and a hands-on experience of the rural ‘resilient’ life. Resilience moves far beyond current definitions of sustainability. On a 2-week homestay, you get to take part in everything that rural village life offers. Don’t worry – there is no enforced programme here. 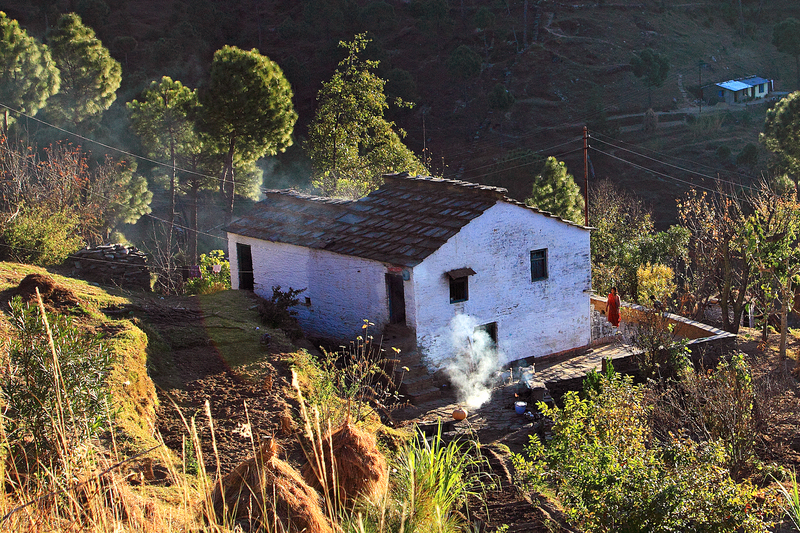 You are free to just rest and explore if that’s what you need, but guests usually end up getting quite involved with village life; learning about everything from organic seed banking, to preparing grain harvests, to tending to the village cows, cooking the local Kumaoni cuisine, or celebrating one of the many festivals that happen throughout India. The Yoga Hall was listed as one of the top ten yoga venues of the world by The Guardian newspaper. The Vrikshalaya centre is the headquarters and heart of the Foundation. 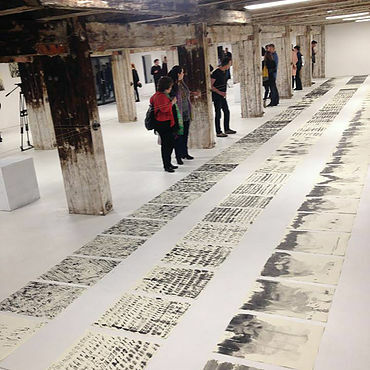 It also offers longer-term residencies for artists and designers who are interested in exploring the principles of resilience as part of their work. Vrikshalaya means ‘Home of the Trees’ in Sanskrit – so outdoor activities such as rock-climbing, water rafting, camping and hiking are all part of nature immersion. 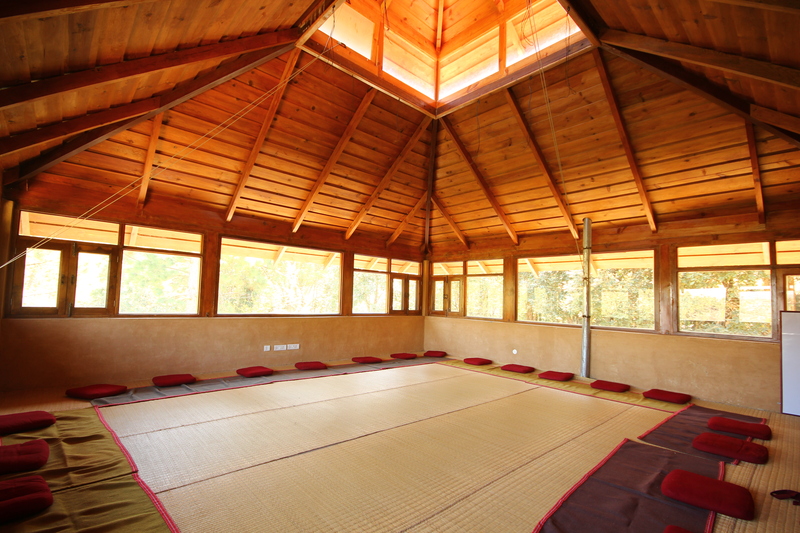 The area is stunning, and the centre has been listed as one of ten top yoga venues in the world by the Guardian newspaper. The aim of the foundation is to get people to experience three basic principles of Resilience that sustain all life; Dignity of Physical Work, Interdependence and Interconnectivity. Women transplanting of rice accompanied by a Hudikia Ball musician. Photo by Dhirendra Bisht. 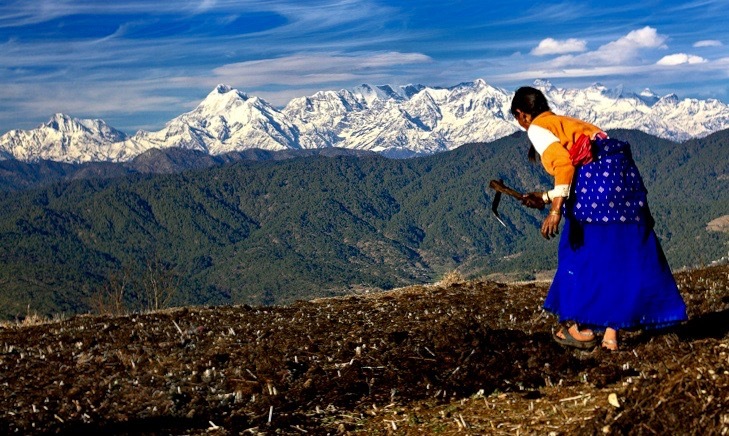 There is a long tradition in India of travelling to the Himalayas and rural areas to practice yoga and meditation as a spiritual practice, but not physical work. 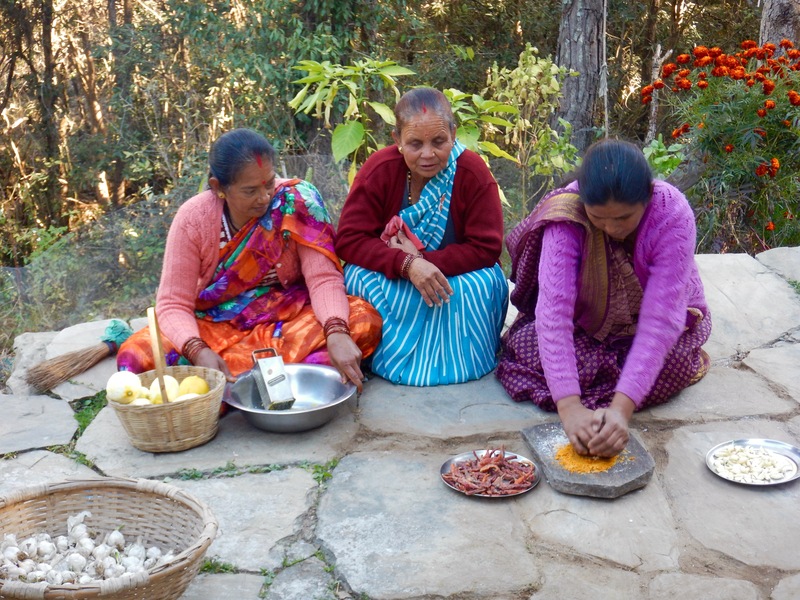 Specific tasks, such as tailoring, traditional music, cleaning and different crafts, are often associated with specific castes. It’s considered servant’s work. And work is very gendered. Traditionally, women prepare the food, work in the fields and take care of the house. A recent survey revealed that women spend more time in the fields farming than men and bullocks combined! Also, the homestay families are from different castes. This was purposefully provocative on Ajay’s part. The foundation hosts communal events for the visitors and their host families, challenging these deeply ingrained practices. Traditionally, lower castes do not eat together with higher castes. They do not attend the same meetings. Lower castes are even given separate plates and cutlery if they go to the house of a higher caste. For the visitors, the learning curve is clear. Artisanal types of work and growing our own food re-connects our minds and hands. Doing something mindful with our hands together with others is natural and enjoyable. The repetitive actions of simple tasks also have a positive effect on the mind and body. When your mind can reach a level of sustained calmness, your body starts to do miraculous things. It’s called the ‘deep relaxation response’ in psychology. The stress hormone cortisol isn’t frantically released as our bodies aren’t in a fight or flee mode, aggravated by extremes in emotion. Combine this innate calmness with physical movement and you have a recipe for better mental and physical health. Interdependence is about people, reciprocity and solidarity. We are all used to financial transactions; I buy something and I pay for it, I own it. But it’s far smarter and more beneficial for the individual to systemically build a society around shared spaces and shared resources. In the village, not everyone has to take care of their cows every-day. They can share the duties, and reduce the daily work from once a day to once every 30 days. Celebrating Diwali. Photo by Pete Zhivkov. Traditionally, when someone dies in India they are cremated on an open funeral pyre. So when someone dies everyone visits the house in mourning to pay their respects and donate some wood. The job of collecting wood for the funeral pyre is taken care of by the community. Community takes care of necessities. It used to be the same with cooking for a wedding. Surplus food and goods are also distributed throughout the community to those in need. Interdependence exists as a fact, so working with it is just common sense. A host family house in the village. The third and final principle of the foundation is Interconnectivity. This is about striving for a harmonious coexistence with nature, as we rely on our environment for all the resources that keep us alive. 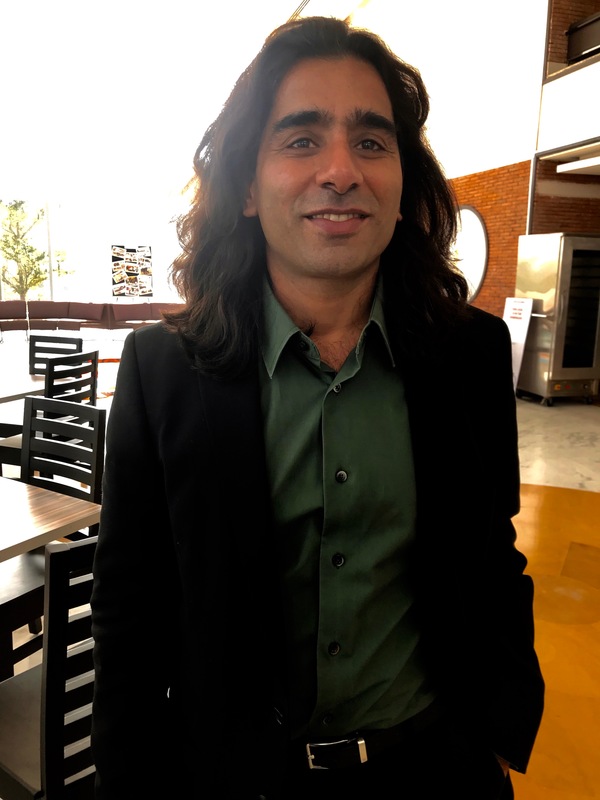 Ajay’s hope is that people will take the realisation of interconnectivity back with them and apply it to their own lives. Celebrating Spring. Photo by Jogendra Bisht. As a modern, connected culture, we need to cultivate an attitude of care and understand where the things that sustain us come from and go to. Our resources are not limitless. Food, water and energy doesn’t just appear, just as clothes and products do not just appear. Our culture of waste has inherent challenges. All our actions have an impact and an intrinsic cost that someone somewhere must pay. If we keep that connection in mind the impact on our everyday choices can be profound. Words by Tanya Kim Grassley. Published in The Forumist, March 2018. 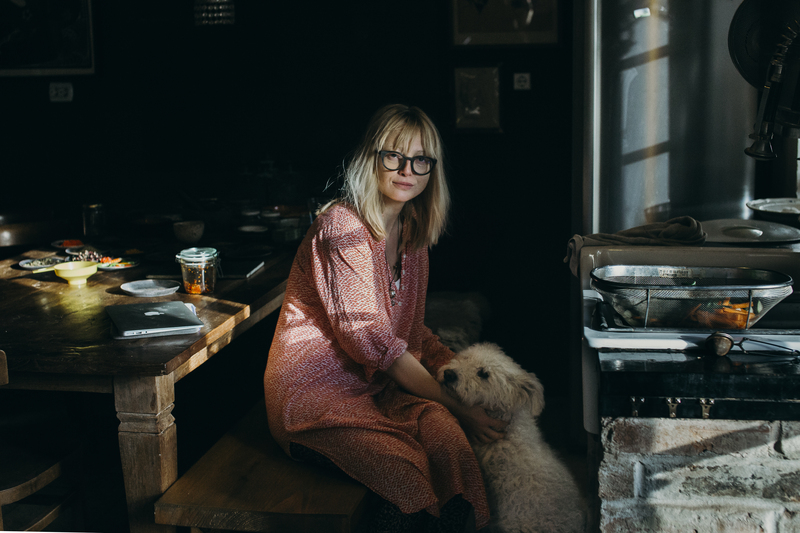 Karina and Gazsi, at home in their cottage. Gazsi is a local Pumi dog. Photo by Alexandra Heim. A: I grew up in Latvia. I played in our family vegetable garden since I could walk, and was outdoors all year round. As a teenager in Riga, I spent every free minute with my friends making fires on the beach or partying in the forest. Q: Why did you move away? A: I studied in Copenhagen and was recruited right away into a job in innovation, that was still a relatively new field at the time. I got to work with some amazing professionals – architects, designers, and thought leaders. It was like working with rock stars! But Copenhagen was never really ‘my town,’ despite all the ‘goodies’ that came with life in the city. It felt like my lifestyle was bought, somehow. Q: How did your job evolve your thinking? A: I found it challenging to accept that so many great ideas, which would truly help people to live a better and more sustainable everyday life, would get chiselled down to fit into existing production systems. It’s as if we design for machines rather than people. We have all the technologies we need, but we have heavy, outdated systems that are resistant to change. I started wondering what else I could do. Q: So you decided to leave your job? A: Not immediately, but I knew I needed to change my own path. I wanted to be able to seek answers to the ‘big’ questions. Eventually Aron and I decided to make the leap and move to the countryside in Hungary. 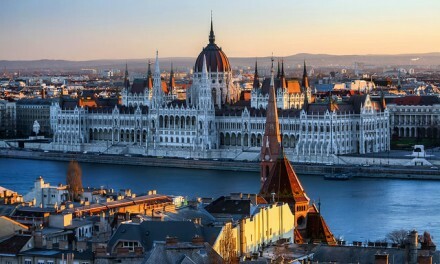 Aron is half Hungarian, but it wasn’t particularly about living in Hungary, it was about pursuing a quality of life with less, and rediscovering ourselves without a professional identity tag. We moved in the middle of winter, without TV or internet. It was the most silent 3 months of my life! 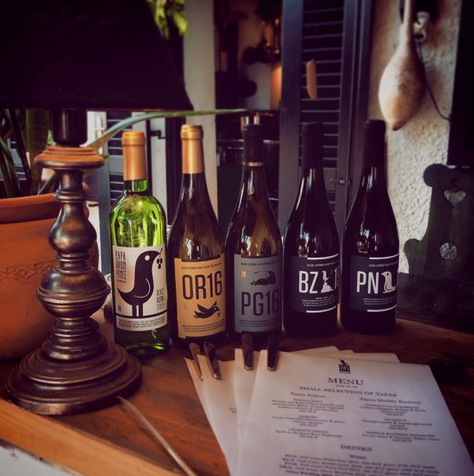 PAP Wines Garden Restaurant- Under the Volcano. Q: How did you cope with that silence? A: Just by giving it a chance. We missed our friends, but we were also in love with our new home on the hill. In the Spring, I started gardening. Portuguese friends had told me about permaculture, and so I spent hours on YouTube learning everything I could. My first garden was a mandala garden; a beautiful, unruly patch. I was the laughing stock of the neighbourhood at first, but when my neighbours saw how my garden was flourishing, even during periods of drought, they switched to permaculture methods. I also practice companion planting, where you pair plants that can support each other with nutrition and healthy insect populations; my strawberries grew together with spinach, for example. It’s pretty in its own wild way. 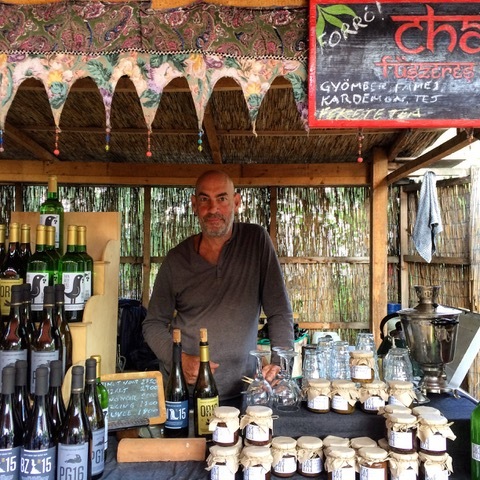 Aron selling at the Farmer’s Market – from chai and chutney to wine, 2017. Q: So your food brand evolved almost by accident? A: Yes! Suddenly we had all this surplus produce so we started making condiments to sell at the farmer’s market. We made our own labels and suddenly we had a brand! A: One day, Aron announced, “Do you realise we are living in one of the world’s very famous wine growing volcanic regions? We should make wine!” My response was a hesitant ‘OK…’ Aron went to work for a local wine maker, to learn the ropes. A year later, Aron made his first wine, a ruby coloured Pinot Noir. We made 300 bottles. It was excellent. We couldn’t believe it. It was like we had the volcano gods on our side! A selection of PAP Wines. A: The wine is organic, yes, and with a low sulphite content, but for us it’s not about labelling our product as ‘organic’ or getting expensive certifications, it’s just about being true to the traditional, artisanal wine-making methods. We want to make the most honest and highest quality wine we can, while caring for the land. Many of the new wine makers here follow regenerative farming methods – it’s far less costly and far more effective. Aron in the kitchen, January 2017. Photo by Alexandra Heim. Q: When did you decide to open the restaurant? 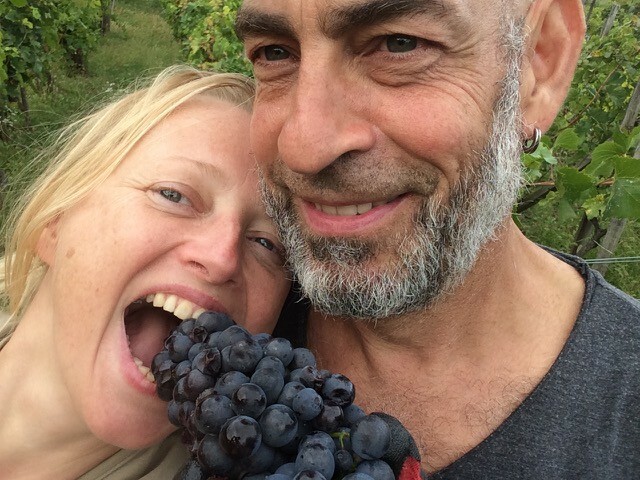 A: Our wines became commercially successful within 2 years, and our garden was abundant. It was a natural progression to pursue Aron’s dream of having a small restaurant. He is an exceptional chef, albeit with no formal training. 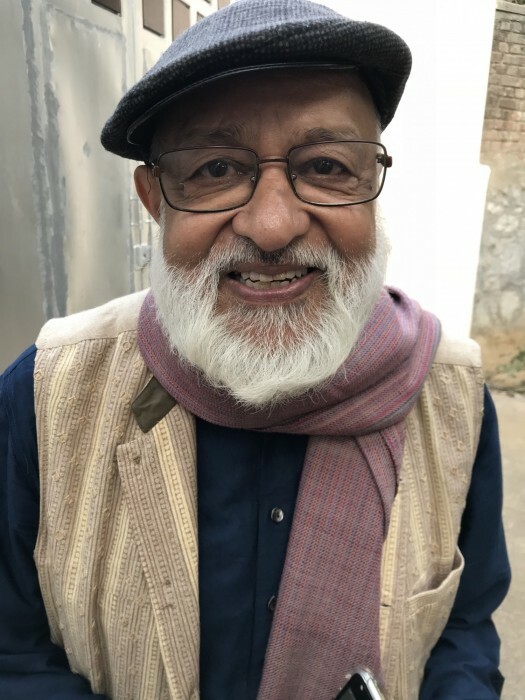 Aron had learnt to cook regional dishes, in Tamil Nadu, in the south of India, and in Himachal Pradesh, up in the North, in the foothills of the Himalayas. This influenced our concept – Indian, Middle Eastern and Mediterranean vegetarian tapas-sized dishes served with local wines . We just offered our own home cooking. We opened for guests last summer and it turned to be the busiest summer of our lives! Q: How does your life today compare with life in the city? A: Countryside offers an unveiled life, a connection to oneself and the systems that let you survive. Leo Tolstoy wrote about the division of intellectual and physical labour, and the need to experience both to acquire true wisdom. I couldn’t agree more. I scribble away about sustainability, but I feel that it is the experience of working the land and being part of a community that entitles me to write about sustainability. PAP’s ceramic plates and Aron’s samosas. Photo by Alexandra Heim. A: I want to continue writing and consulting. I still have more questions than I have answers, and I get the feeling others do too. But we need to ask the right questions. If I can attend to the vineyards and the garden during the season, run our little home restaurant, and write for the rest of the time, I will be a very happy and lucky person. Karina and Aron, Pinot Noir harvest 2017. Q: Any advice to someone wanting to make a total change in their lives? A: Dream! Plan big and trust your intuition. Life is unpredictable but it’s also full of opportunities. You just need to have the courage to believe in yourself. These days, we have a false sense of security because of social transparency, where events and emotions that used to be very private are always on a display on social media. We have an impression that we are emotionally connected to other people, which also gives the false impression of a safety net. I find that such a net, if it indeed exists, is very thin. Despite social media, we are more dependent on relationships in our physical communities than we realise – and the support that they can provide. Nurture real connections. Value where the things in your life come from and go to. When taking a life changing step, make sure your ties are offline as much as online. Images: Alexandra Heim and otherwise, Karina’s own. Food for Change a new platform in Stockholm. Food for Change is a CSR platform for businesses connecting waste food with people in need. Local supermarkets explore how to reuse all the waste food they throw away every day, by creating a membership scheme for low-income people. Membership or gift cards for people in need costs roughly 50 euro to gain access to regular food deliveries. The programme invites volunteers to deliver the food to local communities. Many large companies invite their employees to take part in the scheme as a CSR effort. Networks: The carpet manufacturer Interface has created a sustainable line of products called Net-Works. Net-Works is the first step in creating a truly restorative loop in carpet tile production, whilst cleaning up oceans and beaches of plastic and creating financial opportunities for informal economies; some of the poorest people in the world. 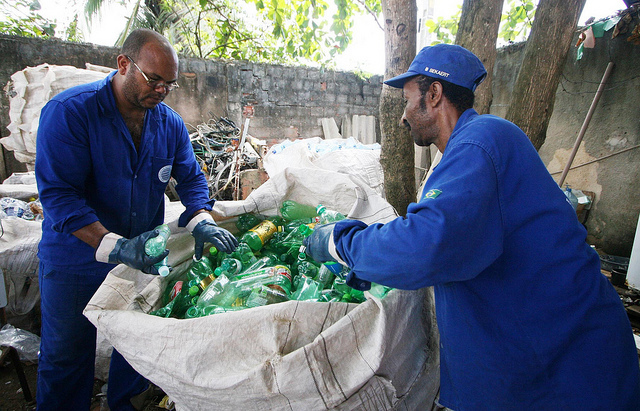 A firm in Brazil, Arteplas, is taking plastic bottles out of landfills and repurposing them as high quality rope. Treehugger reports that their product is both higher quality and cheaper than traditional rope constructed from fibres. Arteplas have independent analysis from a third party assessor showing that their recycling processes for rope use 70% less energy than ropes from virgin materials. Their plant employing up to 400 local people. The quality of the product, is proven in the success of the company and its applied use across different industries. Blest. Making oil from waste plastics: Typically made from petroleum, it is estimated that 7% of the world’s annual oil production is used to produce and manufacture plastic. That is more than the oil consumed by the entire African continent. A Japanese company called Blest created a small, very safe and easy-to-use machine that can convert several types of plastic back into oil. Amazing. A machine like this would be invaluable to informal waste pickers the world over, allowing them to add value to collected plastics. The Green Hanger Made in Australia from 100% recycled cardboard, the Green Hanger will be used as an event invitation during Tokyo Designers Week, then as a coat hanger. 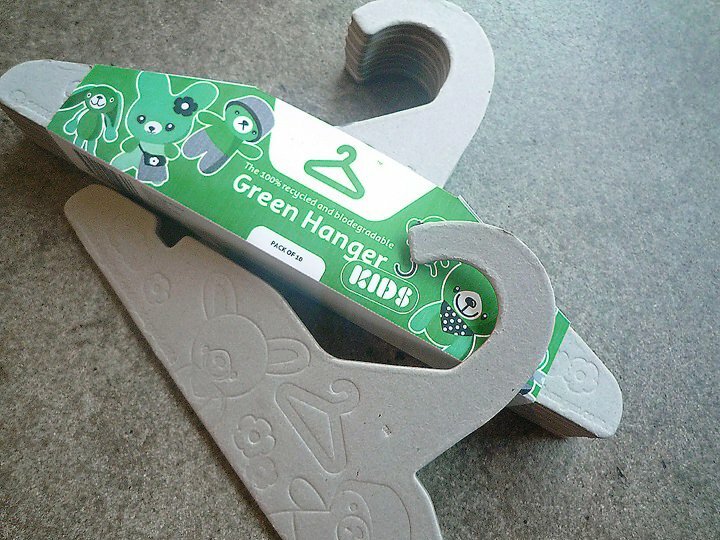 The Green Hanger eco coat hanger is a fully recyclable and biodegradable cardboard coat hanger made from 100% recycled materials. 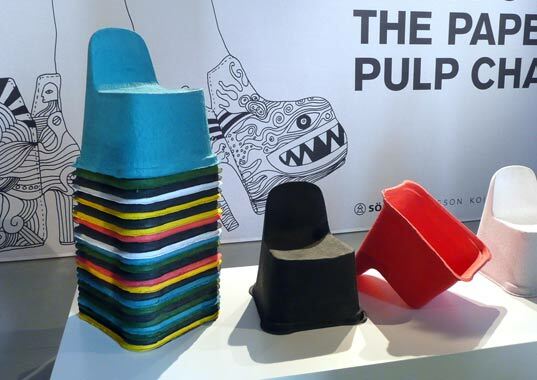 Parapu Durapulp pressed chair by Södra in Sweden is a winner of the Red Dot Design award; the product concept is a collaboration between an ad agency, the pulp manufacturer, KTH and famous PR-driving designers Claesson Koivisto Rune. DuraPulp is a new material that combines paper pulp and PLA (a biodegradable plastic) to create an incredibly resistant paper. 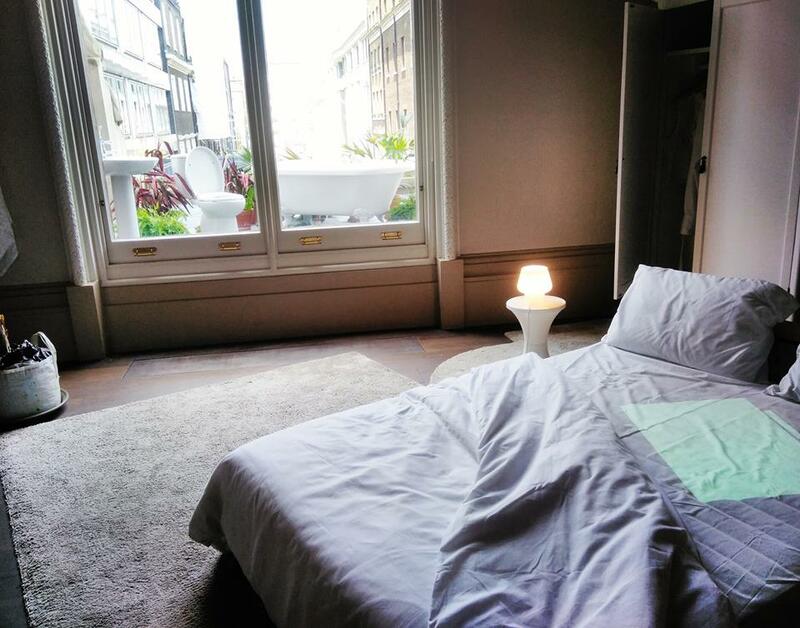 Created from one pressed cut out sheet the new product demonstrates how a simple manufacturing process can add value to raw waste materials and create perceived value for the hotels and companies who use it. Eco-Drywall: While recent interest in sustainable building has spurred the creation of eco-minded materials like Greensulate and Cow Dung Bricks, drywall is one building component that has remained essentially the same over the past 100 or so years. That’s about to change, however, thanks to EcoRock, a new drywall material that’s made of 80 percent recycled materials. Poly-Al is made from recycled Tetra Pak. Tetra Pak Europe pays a local producer to take care of old Tetra Pak. He removes the paper part and recycles and then uses the plastic/metal foil part to make a board, 15 mm thick, flat or corrugated that is used as a building material in walls or roofs. It is water proof, fire resistance and uses no additives in the compression process. They have started to use it for making cow-sheds in India and it has increased the milk productivity with 2-3 l per cow per day! It keeps the cows cool and comfortable, and is a beautiful material as well! For more cases see The Ellen Macarthur Foundation.